Spent the weekend birdwatching in Norfolk. This was a birthday present to my husband and his first experience of a guided tour. I'm a complete novice so was completely out of my depth and making rookie errors. Apparently we saw 100 different species of bird over two days. I can tell you it was fresh on the coast, and I could have done with another layer or two! Birdwatchers have no qualms about standing staring through a scope for hours without moving. Atleast photographers get to move around a bit! nice gift for your husband! What a lovely birthday gift, but I think I would have let him enjoy it alone at this time of year! It looks very windswept. My husband goes out regularly with a birdwatching group. I just don't have the patience ha ha. Luckily the weather is much warmer her. I am sure they must freeze right down to the bone in the UK in winter. A lovely experience - looks very windy! I love this. I jut knew it was Norfolk! It captures the Norfolk beach! 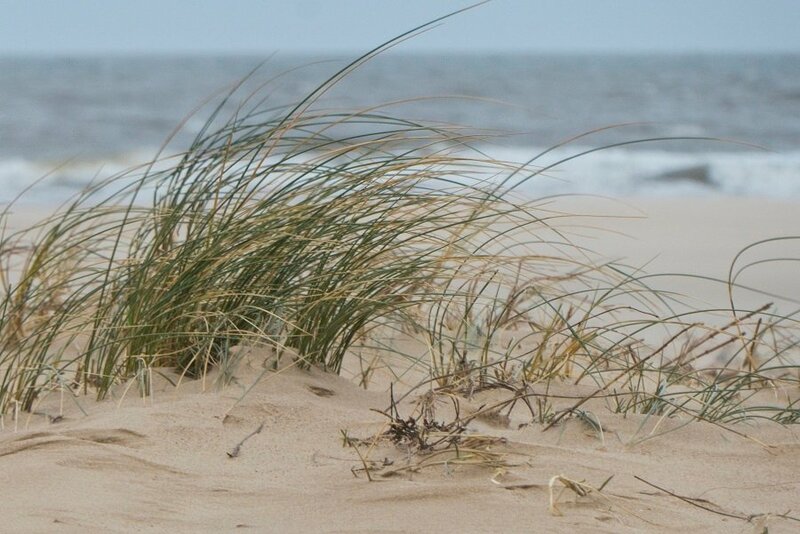 ….dunes and grasses. Such a lovely place. We're off there again for a few days in March. My hubby doesn't know, it's a surprise. We love it there. I love this - the way the sand has blown up against and around the grass. I can almost feel it stinging my face. Well, your weekend was an experience Helen.